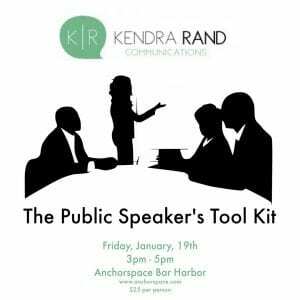 If it’s been a few years since your college speech class (or you cleverly avoided taking Public Speaking 101), join this quick, interactive and fun workshop to sharpen a few communication tools and get a little supportive feedback on your own speaking style. Participants will leave with a helpful checklist of tricks for boosting confidence in their next public speaking or presentation opportunity. This workshop is given by Kendra Rand who has been teaching public speaking, communication studies and media writing since 1999. She currently serves as an instructor for the University of Maine Department of Communication & Journalism.